Only NuShield can make this claim about its product. DayVue™ film was specifically designed to cancel out reflected light while allowing transmitted light through. The special coatings absorb reflected glare. The DayVue also provides excellent protection of the display screen from scratches caused by harsh chemicals, sand, grit, dirt, sea salt, and sharp objects that might be used to navigate the screen. NuShield has been supporting various manufacturers of rugged tablets and notebooks to increase screen visibility and protect the display from damage. Some of the tablets are used to monitor the functioning of other electronic devices and support combat missions, both on land and at sea. 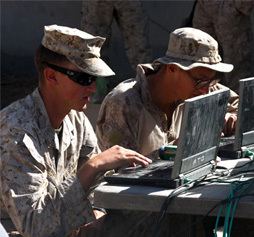 The laptops are used for communications and mission management in Iran and Afghanistan where sand and dust is a constant enemy and screen protection is mission critical. The DayVue film is also deployed on GPS type devices used in armored and transportation vehicles to eliminate glare and protect the screen from constant touch damage. Other uses include protection of handheld communications devices with LCD displays and touch screens. NuShield makes this same film available for industrial, corporate or personal applications such as your laptop, tablet, smart phone and other handheld devices.